A neighborhood lacking digital literacy is at a competitive disadvantage. LISC’s civic tech programs help residents apply for jobs online, learn about government data, and use online tools to improve their lives. LISC’s Smart Communities digital inclusion campaign led to a 15 percent increase in internet usage in five neighborhoods. For more information about LISC's civic tech initiatives, contact Taryn Roch. How community developers and software creators work together to make neighborhoods better and stronger. Members learn about community development while working with middle-school students, teaching digital skills or playing sports. 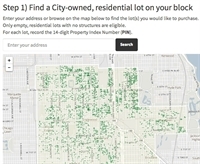 When the city announced a new program to sell vacant lots for $1, Teamwork Englewood and Chicago's civic tech partners responded with a website to make it easier to apply. More than $1.1 million invested by LISC for expanded trainings and digital resources, helping neighborhoods connect to portals, EveryBlock, open data and more. At a recent Urban Forum on technology and resilience, LISC’s executive director cautioned that “shiny new toys” are no substitute for trusted relationships. Tech efforts are popping up all across LISC’s neighborhood network as community groups take small but important steps into the high-tech world. The Knight Foundation awarded a grant to LISC Chicago to support resident engagement in Pilsen and Englewood that will better connect neighborhoods to Chicago's open gov and civic hacking communities. Two crowded rooms and plenty of stories provided a vivid picture of Chicago’s Smart Communities Program for a Washington, D.C., delegation checking up on the federally funded effort. The Greater Auburn-Gresham Development Corporation (GADC) launched its Smart Communities Initiative with a digital and red carpet theme.